Down East Books, 9780892726899, 32pp. Two earnest but not very well informed friends attempt to find and incubate moose eggs so that Moose can have some youngsters to raise. No surprise that they are not successful. The characters are bumbling but well-intentioned fellows who get themselves into scrapes that all work out okay in the end. 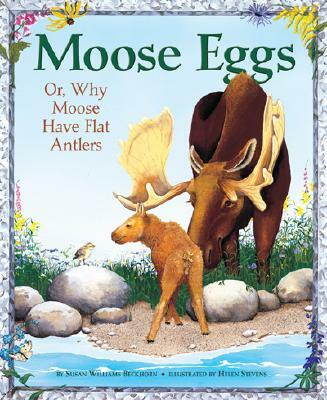 This is a charmingly imaginative explanation of how Moose got his big, flat antlers; droopy nose; and wide hooves.